In 1992 a small number of ex Hydra ship's company held an informal get together to celebrate the tenth anniversary of HMS Hydra's service in the Falklands. During the evening it was suggested that some form of "H" boat society would be a good idea, the seed was sown. The following year, 42 people descended upon The Sandringham Hotel in Southsea for the inaugral meeting and dinner of the "H" Boat Association. The idea of including all Survey Ships in the new Association was muted and to this end a referendum was to be organized. 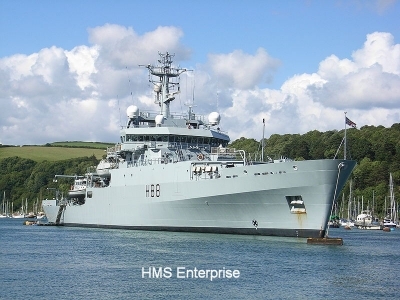 There was an excellent response to the referendum and at the 1994 AGM, with a majority vote, the Association was expanded to encompass all RN Survey Ships past and present. The new title, "THE SURVEY SHIPS ASSOCIATION". The object of the Association is to perpetuate the "Esprit de Corps" and comradeship amongst past and present Ships Companies of all Royal Navy Survey Ships. If you have any suggestions for improving or enhancing this site, or if you would like to input material, contact George Jones.